He was born in the United Arab Emirates, and moved to Silver Spring, Maryland, at age 2. He graduated from Kennedy High School in 1996 and the University of Virginia in 2000. He lived in Bristow, Virginia, and was an ordnance officer with the Germany-based 201st Forward Support Battalion, 1st Infantry Division. He died in a suicide car bombing at the main gates of his base. His unit was charged with the day-to-day security and maintenance of the camp. When an orange-colored taxi drove toward them, he ordered his soldiers to "hit the dirt." He walked toward the car, motioning for it to stop. A makeshift bomb inside it exploded, killing him and two Iraqi civilians in addition to the two suicide bombers. Ten soldiers and six Iraqi citizens were also wounded. During his three months in Iraq, he helped put Iraqi civilians to work for $5 an hour patrolling the streets of Baquba under the U.S. Army. The program, dubbed the United States-Iraq Sponsorship Program, was intended to help combat high unemployment and provide the local population with security and peace. He was posthumously awarded a Bronze Star and a Purple Heart. American citizen of Pakistani descent, and an officer in the United States Army who was killed in Iraq during Operation Iraqi Freedom. Whenever I talked to him, I started to cry," said his mother, Ghazala Khan, 52. He always said to me, Don't worry. I'm safe. The last time she spoke to her 27-year-old son was Mothers Day, May 9. Yesterday, under the hot midday sun, she and her husband, Khizr M. Khan, 53, watched as their middle son was laid to rest at Arlington National Cemetery. Khans was the 66th casualty of the Iraq war to be buried on the cemeterys lush, manicured hills. His flag~draped wood coffin was placed at the end of a row of marble headstones. On June 8, Khan died in a suicide car bombing at the main gates of his base. Khan, an ordnance officer with the Germany-based 201st Forward Support Battalion, 1st Infantry Division, had watched as several of his soldiers prepared to do a routine vehicle inspection. His unit was charged with the day~to~day security and maintenance of the camp. When an orange~colored taxi drove toward them, Khan ordered his soldiers to hit the dirt, said his father, who received details of his son's death from his commanding officer. Khans father said he is proud of his sons courage but is devastated by the loss. Where did his strength come from to face such a danger instead of hiding behind a pole or booth or something? his father said. Normally we would try to hide. Had he done that, there would be no problem at all. It may have not been fatal. He was always a peacemaker, Khizr Khan said, always seeing an opportunity to give. He always said to the Iraqis, We're here not to hurt you but to help you. Whenever I was upset, he always found the right words. He always calmed me down, she said. He was perfect. He was the most wonderful person I have ever met. He died selflessly and courageously, tackling the enemy head on, Mitchell wrote. We will not forget him and the noble ideas he stood for. Khan was born in the United Arab Emirates, to Khizr and Ghazala Khan, who are of Pakistani heritage. The Khan family moved to the United States when Humayun was two years old, and he was raised in Silver Spring, Maryland. As a young child, Khan read extensively about Thomas Jefferson. In high school, he taught disabled children swimming. Khan graduated from John F. Kennedy High School in 1996, and the University of Virginia (U.Va.) in 2000. At U.Va., Khan joined the university's Army Reserve Officers' Training Corps. Khan joined the United States Army and had planned on becoming a military lawyer. In the Army, Khan achieved the rank of captain. In 2004, Khan was assigned to the Headquarters Company of the 201st Forward Support Battalion, 1st Infantry Division in Vilseck, Germany. Three to four months into his tour of duty in Iraq, on June 8 near Baqubah, Khan was inspecting a guard post when a suspicious taxicab began approaching too quickly. Ordering his subordinates away from the vehicle, Khan ran forward 10ÃƒÂƒÃ‚ÂƒÃƒÂ‚Ã‚ÂƒÃƒÂƒÃ‚Â‚ÃƒÂ‚Ã‚ÂƒÃƒÂƒÃ‚ÂƒÃƒÂ‚Ã‚Â‚ÃƒÂƒÃ‚Â‚ÃƒÂ‚Ã‚ÂƒÃƒÂƒÃ‚ÂƒÃƒÂ‚Ã‚ÂƒÃƒÂƒÃ‚Â‚ÃƒÂ‚Ã‚Â‚ÃƒÂƒÃ‚ÂƒÃƒÂ‚Ã‚Â‚ÃƒÂƒÃ‚Â‚ÃƒÂ‚Ã‚Â¢ÃƒÂƒÃ‚ÂƒÃƒÂ‚Ã‚ÂƒÃƒÂƒÃ‚Â‚ÃƒÂ‚Ã‚ÂƒÃƒÂƒÃ‚ÂƒÃƒÂ‚Ã‚Â‚ÃƒÂƒÃ‚Â‚ÃƒÂ‚Ã‚Â‚ÃƒÂƒÃ‚ÂƒÃƒÂ‚Ã‚ÂƒÃƒÂƒÃ‚Â‚ÃƒÂ‚Ã‚Â‚ÃƒÂƒÃ‚ÂƒÃƒÂ‚Ã‚Â‚ÃƒÂƒÃ‚Â‚ÃƒÂ‚Ã‚Â€ÃƒÂƒÃ‚ÂƒÃƒÂ‚Ã‚ÂƒÃƒÂƒÃ‚Â‚ÃƒÂ‚Ã‚ÂƒÃƒÂƒÃ‚ÂƒÃƒÂ‚Ã‚Â‚ÃƒÂƒÃ‚Â‚ÃƒÂ‚Ã‚Â‚ÃƒÂƒÃ‚ÂƒÃƒÂ‚Ã‚ÂƒÃƒÂƒÃ‚Â‚ÃƒÂ‚Ã‚Â‚ÃƒÂƒÃ‚ÂƒÃƒÂ‚Ã‚Â‚ÃƒÂƒÃ‚Â‚ÃƒÂ‚Ã‚Â“15 steps and was killed by a suicide car bomb fitted with an improvised explosive device. The car detonated before it could reach the gates or the nearby mess hall where hundreds of soldiers were eating breakfast. The blast also killed the two occupants of the vehicle and two Iraqi bystanders. On June 15, Khan was buried at Arlington National Cemetery. Legacy The first U.Va. graduate to die in combat since the Vietnam War, Khan was honored by two university ceremonies. Khan was also posthumously awarded the Bronze Star Medal and the Purple Heart. In December 2015, Hillary Clinton, a presidential candidate in the 2016 United States presidential election, spoke about Khan's service, describing him as one of fourteen Muslim Americans who had died in the service of the United States since the September 11 attacks. 2016 DNC speech Further information: Khizr and Ghazala Khan File:Khizr Khan Trumps TheDonald.webm Khizr Khan's remarks during the 2016 Democratic National Convention Khan's parents appeared at the 2016 Democratic National Convention, where his father, Khizr Khan, spoke of his dead son and rebuked the Republican nominee for president, Donald Trump. Trump criticized the appearance of Khan's parents at the Democratic Convention, and suggested that Khan's mother may not have been allowed to speak. Trump's comments about Khan's mother, Ghazala, sparked widespread condemnation and triggered her response as an op-ed in the The Washington Post. On July 31, 2016, Ghazala Khan expressed her thoughts and said she had been too overcome by emotion at the convention to speak at the podium. She wrote, "Donald Trump said I had nothing to say. I do. My son Humayun Khan, an Army captain, died 12 years ago in Iraq. He loved America..." Republican leaders Speaker of the House Paul Ryan and Senate Majority Leader Mitch McConnell have criticized Trump's comments. The strongest rebuke came from US Senator John McCain from Arizona; the former presidential candidate said that Trump did not represent the ideals of the Republican Party and its leaders, and that he had "a moral obligation" to speak out on these issues. His daughter Meghan McCain and granddaughter Caroline criticized Trump explicitly. Veterans of Foreign Wars followed with a statement saying "Election year or not, the VFW will not tolerate anyone berating a Gold Star family member for exercising his or her right of speech or expression". The Islamic State of Iraq and the Levant's online magazine Dabiq published a picture of Humayun Khan's headstone with the caption "Beware of Dying as an apostate." and urged its followers to "[r]eject these calls to disunity and come together." See also Military history of Pakistani Americans Kareem Rashad Sultan Khan (1987ÃƒÂƒÃ‚ÂƒÃƒÂ‚Ã‚ÂƒÃƒÂƒÃ‚Â‚ÃƒÂ‚Ã‚ÂƒÃƒÂƒÃ‚ÂƒÃƒÂ‚Ã‚Â‚ÃƒÂƒÃ‚Â‚ÃƒÂ‚Ã‚Â¢ÃƒÂƒÃ‚ÂƒÃƒÂ‚Ã‚ÂƒÃƒÂƒÃ‚Â‚ÃƒÂ‚Ã‚Â‚ÃƒÂƒÃ‚ÂƒÃƒÂ‚Ã‚Â‚ÃƒÂƒÃ‚Â‚ÃƒÂ‚Ã‚Â€ÃƒÂƒÃ‚ÂƒÃƒÂ‚Ã‚ÂƒÃƒÂƒÃ‚Â‚ÃƒÂ‚Ã‚Â‚ÃƒÂƒÃ‚ÂƒÃƒÂ‚Ã‚Â‚ÃƒÂƒÃ‚Â‚ÃƒÂ‚Ã‚Â“2007), an American soldier and Muslim whose service was discussed during the 2008 U.S. presidential election References Jump up ^ Tapper, Jake [jaketapper] (2016-07-28). 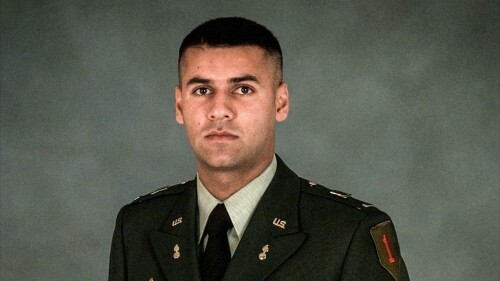 "Army Captain Humayun Khan, 27, was killed by a suicide bomber in Iraq in June 2004. RIP" (Tweet). Archived from the original on 2016-07-30. Retrieved 2016-07-30. ^ Jump up to: a b c d e f McBride, Jessica (2016-07-28). "Captain Humayun Khan: 5 Fast Facts You Need to Know". Heavy.com. Archived from the original on 2016-07-30. Retrieved 2016-07-30. ^ Jump up to: a b Khan, Ghazala (2016-07-31). "Ghazala Khan: Trump criticized my silence. He knows nothing about true sacrifice.". The Washington Post. Washington, D.C.: Fred Ryan. ISSN 0190-8286. ^ Jump up to: a b c d "House Joint Resolution No. 780" (PDF). Virginia's Legislative Information System. Richmond, Virginia: Virginia General Assembly. 2005. Archived from the original on 2016-07-30. Retrieved 2016-07-30. ^ Jump up to: a b c d McCrummen, Stephanie (2005-03-22). "Khizr Khan's loss: A grieving father of a soldier struggles to understand". The Washington Post. Washington, D.C.: Fred Ryan. ISSN 0190-8286. Retrieved 2016-07-30. ^ Jump up to: a b Kelly, Matt (2004-09-24). "U.Va. 's ROTC Divisions Pay Tribute to Fallen Comrade". UVAToday. Richmond, Virginia: University of Virginia. Archived from the original on 2006-09-17. Retrieved 2016-07-30. Jump up ^ Clock, Michele (2004-06-16). "A 'Peacemaker' Is Laid to Rest". The Washington Post. Washington, D.C.: Fred Ryan. ISSN 0190-8286. Jump up ^ Timsit, Annabelle (2016-07-29). "Seven Minutes That Shook the Convention". Politico. Arlington County, Virginia. Archived from the original on 2016-07-30. Retrieved 2016-07-30. How the father of slain Muslim soldier shamed Donald Trump, upstaged Hillary Clinton and gave the country a lesson in values. Jump up ^ Qiu, Linda. "The backstory of the Muslim soldier's dad who said Trump 'sacrificed nothing'". PolitiFact.com. Tampa Bay Times. Archived from the original on 2016-07-29. Retrieved 2016-07-30. Jump up ^ Swaine, Jon; Gambino, Lauren (2016-08-01). "Donald Trump has 'black soul', says Khizr Khan, father of fallen Muslim US soldier". The Guardian (in British English). Kings Place: Guardian Media Group. ISSN 0261-3077. OCLC 60623878. Archived from the original on 2016-08-01. Retrieved 2016-08-01. Jump up ^ Bradner, Eric (2016-07-31). "Khizr Khan: Trump has a 'black soul'". CNN Center: CNN. Archived from the original on 2016-07-31. Retrieved 2016-08-01. Jump up ^ Abramson, Alana; Phelps, Jordyn (2016-08-01). "John McCain Strongly Condemns Trump's Attacks on Khizr Khan, Joining Other Republicans". Times Square Studios: ABC News. Archived from the original on 2016-08-01. Retrieved 2016-08-01. Jump up ^ DelReal, Jose A.; Gearan, Anne (2016-07-30). "Trump stirs outrage after he lashes out at the Muslim parents of a dead U.S. soldier". The Washington Post. Washington, D.C.: Fred Ryan. ISSN 0190-8286. Jump up ^ "Fury as Trump mocks Muslim soldier's mother Ghazala Khan" (in British English). Broadcasting House: BBC News. 2016-07-31. Archived from the original on 2016-07-31. Retrieved 2016-08-01. Republican presidential hopeful Donald Trump has attracted outrage by mocking a dead US Muslim soldier's mother. Jump up ^ "Trump criticized for comments on Muslim mother of fallen US soldier". 1211 Avenue of the Americas: Fox News Channel. 2016-07-30. Archived from the original on 2016-07-31. Retrieved 2016-08-01. Jump up ^ Haberman, Maggie; Oppel Jr., Richard A. (2016-07-30). "Donald Trump Criticizes Muslim Family of Slain U.S. Soldier, Drawing Ire". The New York Times. The New York Times Building: Arthur Ochs Sulzberger Jr. ISSN 0362-4331. OCLC 1645522. Archived from the original on 2016-07-30. Retrieved 2016-08-01. Jump up ^ Karabell, Zachary (2016-08-01). "'Have You No Sense of Decency, Mr. Trump?'". Politico. Arlington County, Virginia. Archived from the original on 2016-08-01. Retrieved 2016-08-02. Jump up ^ Steinhauer, Jennifer (2016-08-02). "John McCain Denounces Donald Trump's Comments on Family of Muslim Soldier". The New York Times. New York City: Arthur Ochs Sulzberger Jr. ISSN 0362-4331. OCLC 1645522. Retrieved 2016-08-02. Jump up ^ Ornitz, Jill (1 August 2016). "Veterans group chastises Trump for attacks on fallen soldier's parents". Los Angeles Times. Jump up ^ "Islamic State calls slain Muslim American soldier an 'apostate'". Canary Wharf: Reuters. 2016-07-31. Archived from the original on 2016-07-31. Retrieved 2016-08-01.